Disney by the Numbers: Facts and Figures About the Walt Disney World Theme Parks and Resorts by Anthony M. Caselnova is a mathematical tour of the Walt Disney World Resort. Caselnova takes readers through every theme park, hotel, restaurant and more within Walt Disney World providing numerically based facts of the attractions and locations being examined. Numbers can include ride capacity, tax information, important dates and many more. Statistics fans will enjoy this book and find the facts leading to more thoughts and questions. I have personally made Tom Sawyer Island my standard for capacity questions, and the island is not doing well when compared to the hourly capacity of some many other things. That is the fun of the book, being able to create your own baselines for exploring the park and comparing apples to apples and apples to oranges within the resort. However, you cannot baseline everything as statistics are not consistent. For example, not every location includes a property value and tax paid figure. So it is not possible to compare all hotels and restaurants for tax purposes. And to do deeper comparative dives I wish there was more consistency in the types of numbers shared. Another issue is the occasional error. 5.8 million hot dogs are sold each year, but 6 million are consumed. Were 200,000 given out for free? A bigger error is in the apple strudel department. The amount of strudel served is represented in both a year and a day. But the number of slices in the same. It appears to be a simple error, but perhaps in the case of hot dogs and strudel they should not have been duplicated. 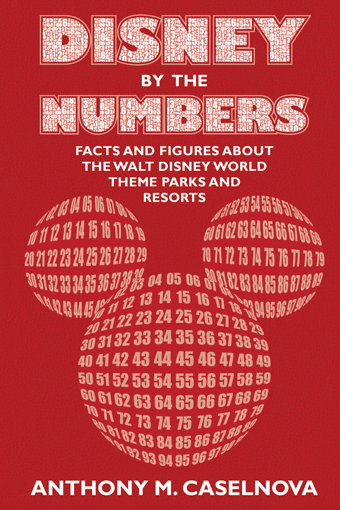 Disney By the Numbers will likely intrigue the mathematically minded Disney fan. And those of us having problems adding one plus two will probably find some interesting facts within its pages. I would recommend that one pick up the lower priced Kindle edition as it will not be everyone's happy place and the electronic format provides easy quick search and reference.